1. In a pan, melt butter then fry the ham until crisp. Remove and set aside. 1. In a same pan, saute garlic and onion. Add fried ham. 3. Add the all purpose cream and grated parmesan cheese. Sprinkle with ground pepper then stir and bring to boil. Add more evaporated milk or a cup of water if the sauce is too creamy or salty. 4. Simmer until beginning to thicken. Remove from heat. 1. Prepare pasta on pasta tray then pour creamy sauce. Top with remaining ham, grated Parmesan cheese and parsley. 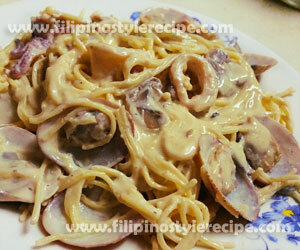 Filipino Style Recipe: Creamy Beef Stroganoff Pasta is a creamy pasta dish made of beef strips and mushrooms cooked in creamy white sauce. 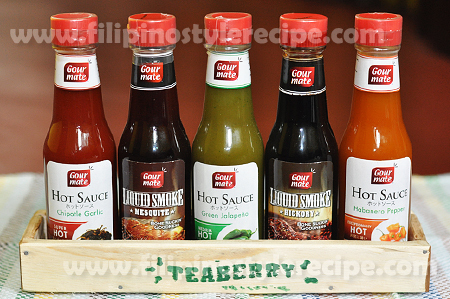 This is commonly serve in any occasion or mid-afternoon snack. 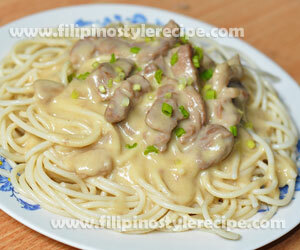 The creamy beef stroganoff can also be serve together with pasta or steamed rice. 1. Prepare pasta based on cooking instructions. Drain and set aside. 1. Marinate beef strips into the red wine, salt and pepper for 15 minutes. Drain beef and reserve the marinade. 2. In a large pan, heat oil then put the beef until browned around 10-15 minutes. Transfer browned beef into a plate. 1. Using the same pan, melt 2 tablespoons butter over medium heat. 2. Saute onion and garlic until translucent then add the mushroom and cook for 5-8 minutes. Transfer into another plate. 1. In the same pan, melt the remaining butter then whisk in flour. Cook over medium heat for around 5 minutes. 2. Add water and beef bouillon then let it boil while stirring constantly. 3. Pour the marinade then add the Worcestershire sauce and mustard. 4. Add the mushroom and beef, cover then simmer until meat is tender around 1 hour. 5. When you are about to serve, stir in the cream cheese and sour cream and cook for 5 minutes. 6. In a serving plate, prepare pasta then top with a generous creamy beef stroganoff. Sprinkle with chopped spring onion. Enjoy. 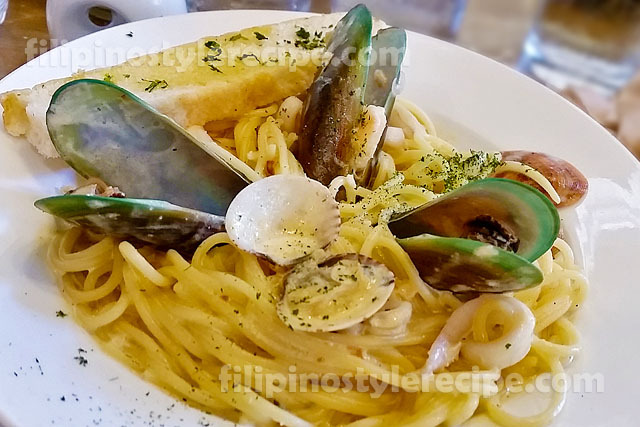 Filipino Style Recipe: Seafood Angel Hair Carbonara is another creamy and mouth-watering seafood-pasta dish. 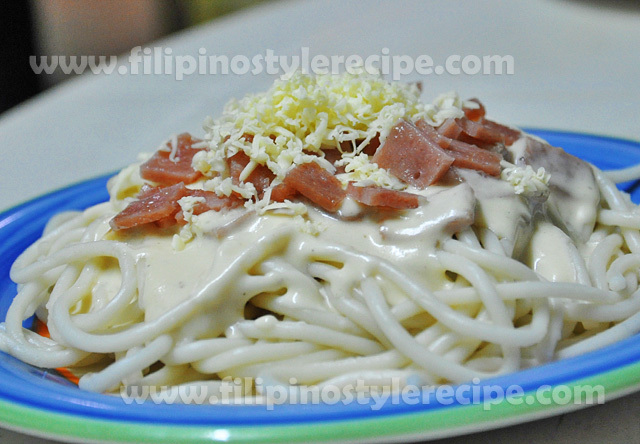 It is consists of seafood such as squid and clams then cooked together with evaporated milk, all purpose cream and cheese. Tossed together and topped with grated cheese. 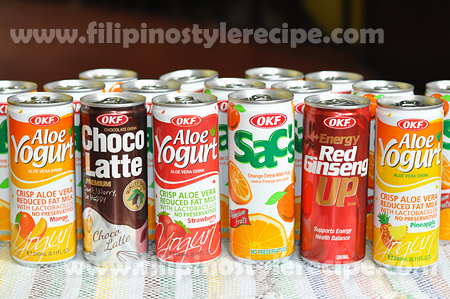 This can be served in any type of occasion or as mid-afternoon snack. 1. In a pan, heat oil then saute garlic, onion and mushroom then saute for 2-3 minutes. 2. Add squid and stir cook for a minute. Remove and set aside. 3. In a same pan, add clams then cover and simmer until shells open. Remove and set aside. 1. In a same pan, add the evaporated milk and all purpose cream then bring to boil while keep stirring. 2. Add the grated cheese then keep stirring for about 3-5 minutes or until beginning to thicken. 3. Put back the clams then adjust seasoning with salt and pepper. Turn off the heat then add squid. 4. In a serving plate, arrange pasta then add the sauce on top. Sprinkle with grated cheese and garnish with parsley. Serve! 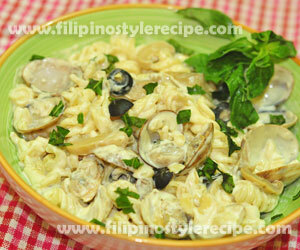 Filipino Style Recipe: Seafood Fusilli in Creamy White Sauce is another creamy and mouth-watering seafood-pasta dish. It is consists of clams cooked in creamy white sauce then tossed together with fusilli. 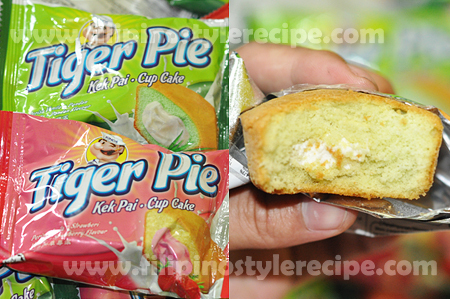 This can be served as meryenda(mid-afternoon snack) or in any special occasion. 1. In a pan, heat oil then saute garlic, onion and chili flakes until light brown. 2. Add the mushroom and olives then saute for 2-3 minutes. 3. Add clams, cover and simmer until shells open. 4. Add the evaporated milk and all purpose cream then bring to boil while keep stirring. 5. Add the grated cheese, salt and pepper to taste then keep stirring for about 3-5 minutes or until beginning to thicken. 6. Turn off the heat, add pasta then toss well. 7. Transfer to serving plate, top with grated cheese and garnish with basil. Serve!